This has to be my new favorite way to cook Brussels sprouts! It's like eating a Planter's Peanut Brittle with your vegetables (that may not sound good to you, but I promise, it's amazing, and not too sweet). 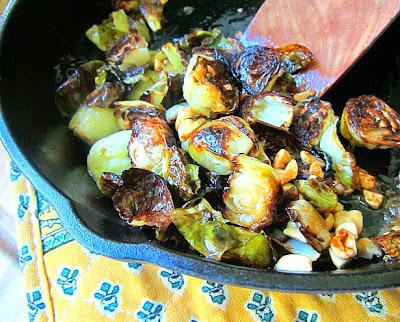 After roasting the little green cabbages, you swirl some honey and butter in a cast iron skillet and cook the vegetables and nuts in this glaze. 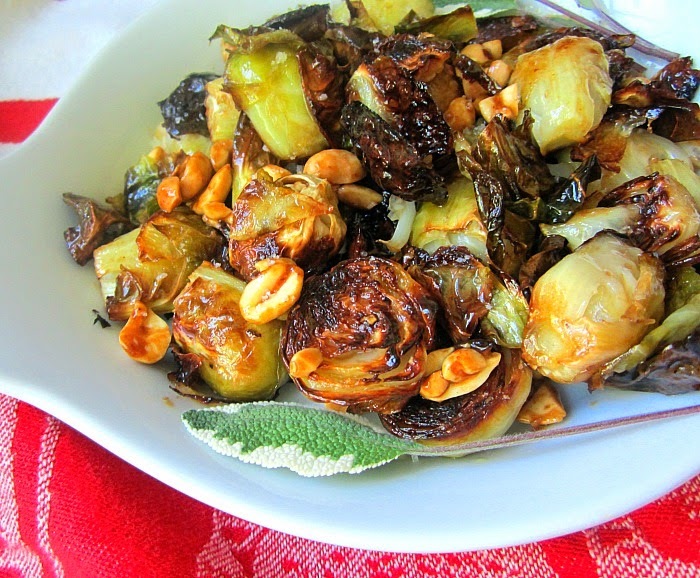 Even Brussels Sprouts haters will love this recipe (are there still any out there????). 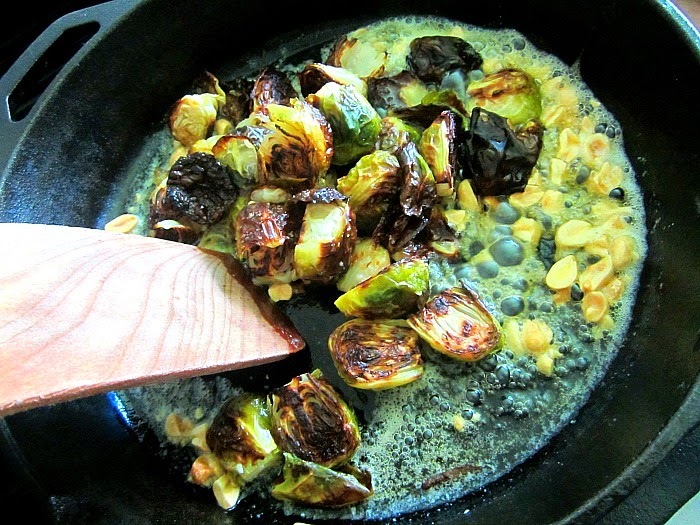 Lay out the Brussels sprout halves on a heavy large sheet pan and drizzle w/ the olive oil and season w/ kosher salt & pepper. Roast in a 375F oven for 20 minutes, checking on them so they are not burning. Roast the peanuts in a large hot cast iron skillet just until fragrant and set aside (I cheated and did everything in the same pan at the same time and it was fine). Heat the butter in the cast iron skillet and add in the honey. Once it starts bubbling, add in the roasted Brussels sprouts and stir for a minute or two until coated w/ the nice syrupy sauce. Add a quick splash of balsamic vinegar to the pan and the chopped peanuts. Love the look of these sprouts - a Europeanized version of a delicious Chinese stir-fry. Thanks for the intro to Frank Prisinzano - his food photography is crazy good, the pasta, I'm STARVING! Hotter, Ms. Snacks, HOTTER! You should be able to handle that ;o!! Learn how to leave a comment on my instagram! Are you afraid your secret identity will be revealed? The egg was hotter and crispier than it looked.....it was really good, go figure, I never like my eggs burned, but this egg was a different animal. I only have an ancient flip phone Ms. Snacks (blush). My darling youngest son says he'll let me use his smart phone to set up an account. If I, we, do, you'll be the first to know! I will try this later this week. Sounds delicious! Made last night, LOVE LOVE THIS DISH! Love brussels sprouts, but this is a combination I NEVER would have thought up. Can't wait to try it!